Inverness was an opportunity to replenish supplies. 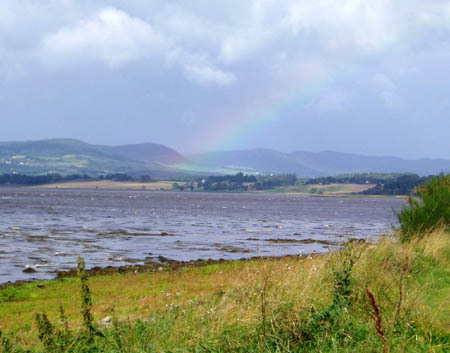 After lunch I headed across the Kessock Bridge to the Black Isle, then took the minor road along the shore of Beauly Firth to the hotel at Coulmore Bay. My leg stood up well to the 15 mile day from Daviot. North of Inverness there are few footpaths, and road walking was unavoidable. On Day 76, I tackled a footpath from Blairdhu shown on the map, which disappeared into an impenetrable thicket. Apart from two short woodland walks near Conon Bridge and Dingwall, the rest of the day was on roads. I stayed that night in a bunkhouse at Evanton. More road walking followed next day, to Alness and then on a minor road to Marybank. I then found a more pleasant off-road route through the forest to the edge of Tain, where I stayed the night. From Tain I had to take the main A9 road past the Glenmorangie distillery and across the Dornoch Firth Bridge into Sutherland. 85 miles to JOG said the sign. Dornoch was an attractive little town (or apparently a city because it has a cathedral), and marked the start of more pleasant walking. The sandy beach was a lot better than pounding asphalt. From Embo the route skirted Loch Fleet, and the mountains came closer. A short stretch back on the A9 was followed by good walking through Balblair Wood and along the beach to Golspie. Susan had driven up from Oxford to share some of the last few days, and we met in Golspie. Four days to go. The scenery was getting better, and it was warm. From Golspie I took the coastal path past Dunrobin Castle and the broch at Carn Liath to Brora. I watched a group of seals playing a few feet away from me. From Brora I walked 2 miles north along the beach. Then it was back on the A9, but at least this far north traffic was relatively light. The mountains, sea and sun put me in a good mood. We stayed that night in Helmsdale, and dined at La Mirage, one of the UK's finest fish and chip shops, with a unique decor. From Helmsdale, the country gets wilder. I followed the winding main road up to the Ord of Caithness, and entered the last county of the trip. A few miles further on, I was able to leave the A9 to visit the deserted village of Badbea, perched on the edge of a cliff. The village had been inhabited by up to 60 people for half a century after the Highland Clearances. Little now remains - yesterday's misery, today's dramatic scenery. 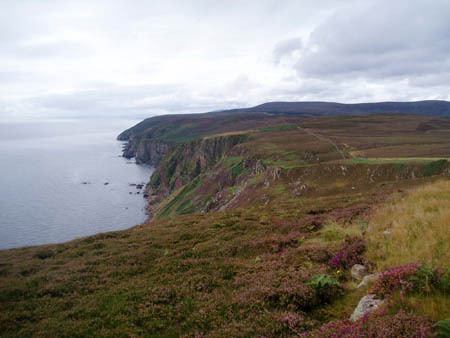 From Badbea I found a route along the clifftop for a few more miles to Berriedale before I was forced back to the A9. Beyond Berriedale the scenery changed. Instead of mountains, there were white cottages scattered across a patchwork of fields, and always the sea stretching to the horizon. 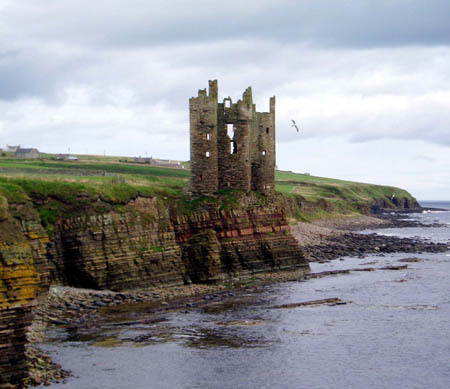 Here Caithness made me think of Cornwall. Even the weather was Cornish. We stayed that night at Dunbeath. Two days to go. More road walking on Day 81. At Bruan I met other walkers for the first time in ten days - four heading for Land's End. The warmth of their congratulations gave me a great boost. Maybe I was about to achieve something special. I did little sightseeing en route, but now and again I came across something which was too good to pass by. One such was Whaligoe, a minute cove once used as a harbour by the herring industry. The only access is by a steep flight of steps. I climbed down to the harbour, and tried to work out how a ship could dock there. Back at the top I met David Nicolson, one of the group of local people who maintain the steps. They do a great job. For the last few miles to the B&B at Wick, I followed the coast path along the cliffs, a dramatic route past sea stacks and geos to the Castle of Old Wick. "It's a bit boggy", they told me at Sarclet. They forgot the bit about the barbed wire and the rifle range across the path. Maybe one day we will get a real North East Coast Path to match the South West Coast Path. One more day and 20 miles to go. I took the main road north from Wick, but after a few miles found a route through the links to the glorious sandy beach of Sinclair's Bay. I walked along the beach to Keiss and admired its tiny harbour and dramatically situated old castle. Back on the road, there was now little traffic. Just before Freswick I stopped and looked at the last bit of land barring sight of John O'Groats. I kept going up Warth Hill. From the top, the Orkneys were clearly visible. A couple of hundred yards more, and the John O'Groats Hotel came into view. Susan came to meet me at the edge of the village. We walked the last mile together. It was 4.45pm when we reached the famous signpost. John O'Groats is not quite the end. Two miles further from Land's End is Duncansby Head. So after checking into our B&B we walked along the north coast to the lighthouse at the end of the road. I'd done it. Updated November 2004. Copyright © Martin Hockey 2004.